When you are under pressure to create a meal pronto, Greek Shrimp Pasta is the perfect quick dish for all seasons. It is effortless to throw together after a busy day or for a last minute gathering of friends. This simple preparation creates a fresh, light, flavorful meal. The saltiness of the kalamata olives paired with fresh tomatoes and basil produces a delicious flavor combination. Serve with a fresh salad, baguette, wine and relax! Prepare the pasta according to package directions. While the pasta is cooking, add the olive oil and butter to another pan set over medium heat. Once the oil and butter are hot, add the fresh shrimp. Chop and dice the remaining ingredients. Turn the shrimp over when they start to become opaque and add the minced garlic. 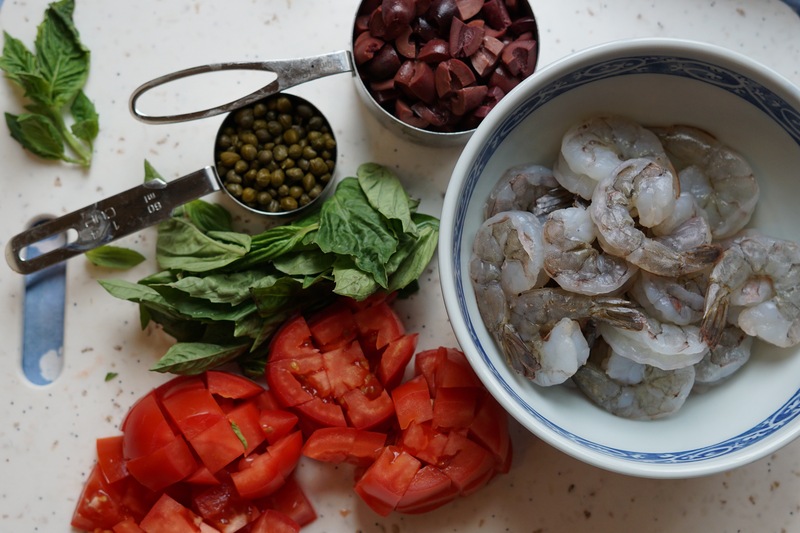 When the shrimp are almost completely opaque or close to your desired doneness, add ingredients in the following order: capers, olives, basil, and tomatoes. Turn off the burner, cover to let the shrimp finish cooking, and allow the remaining ingredients to gently warm through, but not cook. 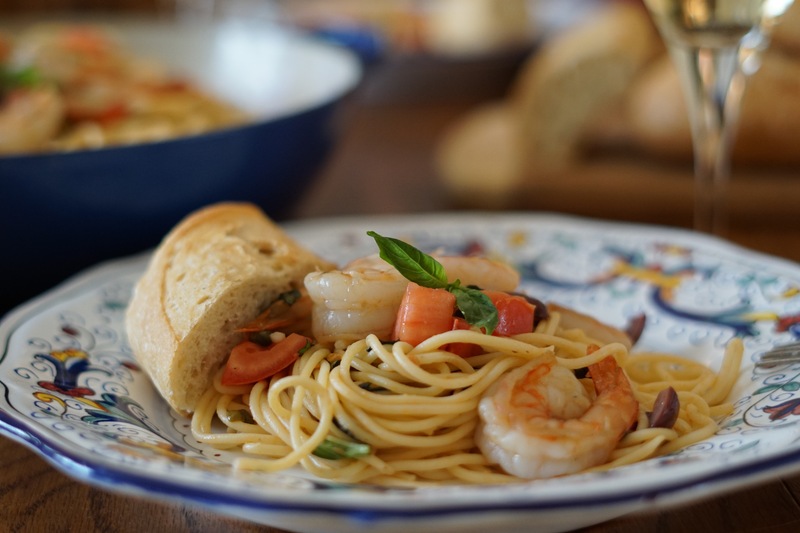 Grilled shrimp also work well in this pasta dish. Baste with a portion of the olive oil and the butter before grilling. Use the remaining olive oil and butter to cook the garlic and continue with the remaining ingredients, incorporating the grilled shrimp before serving. Drain the cooked pasta, add to the prepared ingredients and toss to incorporate. Top with grated Parmesan cheese and serve. My home is a mix of meat eaters and plant-based eaters, so when possible, I prepare a version of one dish for each. Often, I can reserve a portion of a dish mid-prep, before adding the meat, to complete a separate veggie version. This flexible dish requires a couple of quick substitutions. Prepare the pasta according to package directions. While the pasta is cooking, prepare the remaining ingredients. Add the olive oil to a pan placed on medium heat. Once the oil is hot, add the garbanzo beans and garlic. Cook until the garlic begins to brown. Add remaining ingredients in the following order: capers, olives, basil, and tomatoes. Remove from heat, cover and allow ingredients to warm but not cook. Drain your pasta, toss with the prepared ingredients, and serve. Top with nutritional yeast if desired. Questions? Comments? We would love to hear from you! Enjoy!